I'm a New Contributor on Project Nursery! Green Rooms in Honor of St Patrick's Day! 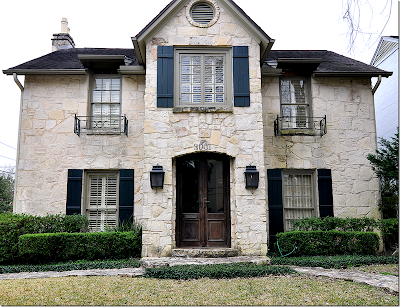 Joni Webb from Cote de Texas had a post this week on a house tour of a wonderful limestone home in Austin Texas. 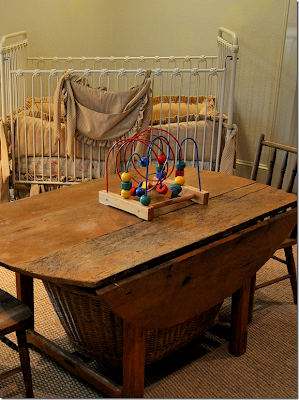 The laid back elegant English country manor inspired look is carried throughout the home even into the children's rooms. The owners of this house have two daughters and a baby boy. 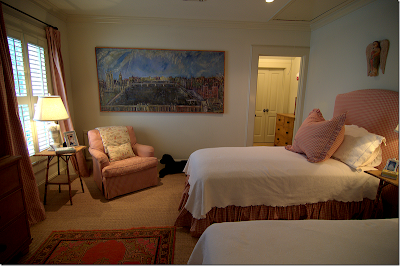 I wanted to share a few photos of the sophisticatd children's rooms as wells some other photos of the child-friendly living room. As an added bonus this house is now on the market and can be yours! 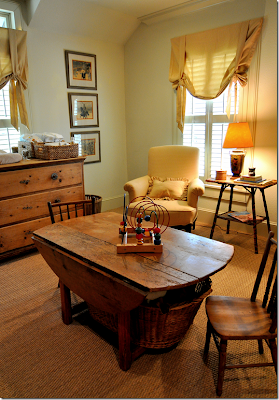 An antique pine dresser serves as the changing table and I love the oversize bows on the window treatments. The daughter's shared room. Seagrass carpet and checks again. 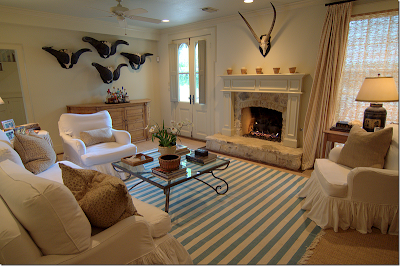 I love the dark African animal horns on the white walls paired with the white skipcovered furniture pieces. 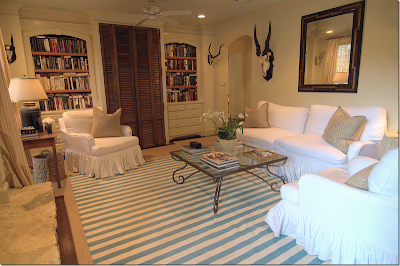 The blue and white dhurrie adds that little punch of color needed in neutral room. You would never know that there was a TV stored behind the shutters. But where are the toys hidden? Maybe in that basket under the table on the left. thanks for the shoutout! muc appreciated. whoa! thank you for the shout out. much appreciated. This replica Chanel backpack is fabricated from calfskin.Its trim is leather.It is belted with tweed.There are several multifunction pockets area user can put their corpuscle phone,lipstick,make-up,etc.I begin that the blush of gucci replica the replica Chanel can fit about all kinds of clothes.It is not bad to own it.What abroad can we ask for a replica handbag?I bought this replica Gucci backpack from an online store.I like this affectionate of handle bag actual much.The apparel in the backpack surface,which appearance the adorableness of louis vuitton replica the artist handbag,are fabricated on purpose by the designer.This replica Gucci makes me feel adequate and affluence if I airing about with it.It is glassy in black.I can abrasion any affectionate of clothes to bout it.So I don't charge absorb time abrading my arch and contemplate which clothing to abrasion in the morning.Gucci is no agnosticism a name humans can trust.A Gucci backpack is one you'll be appreciative to own if you can afford.If it it's out of question,bethink there are some agitating replica Gucci handbags in the market.They'll amount you a atom of what an accurate Gucci bag would amount you and you'll attending great.If you wish to chanel replica buy Breitling Replica Watches,you will accept to accomplish a quick analysis on it on the Google as you will go through a account of top replica watches companies over there and accept cartier replica your 100% able aggregation out of the all.Moreover Replica Breitling Bentley Watches are actual adequate actualization accessories.That is why they do not could cause any array of affliction or abasement to you at all.Stunningly online Breitling Replica Watches industry makes you accessible discounted replica watch globally.